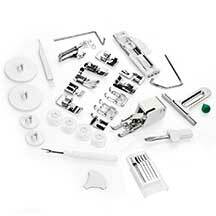 Janome have a few memory craft models available, today I’m going to be looking at the Janome Memory Craft 6600P. This is advertised as a machine for advanced sewing with advanced features and sewing speeds of up to 1000 stitches per minute. Many of the features are designed specifically for quilters including a 9” x 5” throat space. First let’s take a look at the functions and features. The Janome is packed with features, but I’ll start with my top 6 features! AcuFeed – Janome’s own layered fabric feed system. 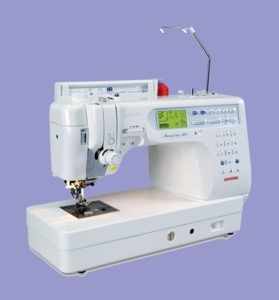 Read more about Janome AcuFeed! One step buttonholes – 7 automatic buttonhole stitches. Automatic tension – No fiddling to get the thread tension correct. Built-in needle threader – safe time with this handy function. Knee lift – keeps your hands free for holding your work in place. 7-piece feed dog – with built in walking foot gives the machine the flexibility to deal with a wide range of fabrics and layers, ideal for quilting. Those are my top 6 but it doesn’t end there, check out the rest of the functions and features of the Janome Memory craft! Needle up/down memory – a great feature especially when quilting. 404 total stitches – a large selection of stitches including the alphabet, buttonholes and monograms. Drop feed- disengages the feed dogs for free motion sewing. Automatic thread cutter – another time saver. Start and stop button – handy on and off button. Locking stitch button – secure the stitch at the end of the sewing. Twin needle guard – safety feature. Speed control slider – easily control your sewing speed. 5 memory banks – Store your favorite patterns. Stitch Editing – Individual and combination stitch editing means custom made stitch patterns. Last stitch recall – recalls the last stitch you were working on. Automatic declutch when bobbin winding – automatically declutches when winding the bobbin. Extra high presser foot lift – ideal for thick layers of fabric. Extension table – included in the package. Easy threading – vertical thread delivery system simple threading guide suitable for novice sewers. Dual sewing light – means a well-lit work area. LCD screen – Provides clear and easy viewing of stitch functions including tension settings, the stitch length and the stitch width. You’ll also see the recommended presser foot, needle up/down position and more. You can adjust the screen brightness to suit. Metal frame – heavy duty metal frame, built to last! 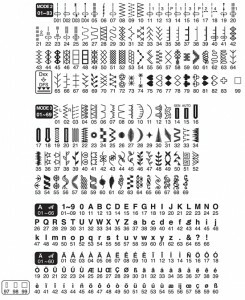 25 needle positions – the needle position can be changed to suit your sewing needs, for example, when sewing zippers cords and top stitching. Box feed –the feed dogs move in a box motion rather than the traditional arc motion. This ensures perfect feeding though out the feed process as there is equal contact between the presser foot and the fabric. On-board storage – conveniently stored accessories in the removable sewing table. You can really get creative with the Janome MC-6300P which includes basic, decorative and stretch stitches. These are suitable for many sewing projects, from clothing construction, quilting, soft furnishings, applique and more. You can use the mirror image function with the touch of a button. There is also an elongation button which adds, even more stitch variety by allowing you to make selected stitches up to 5 times longer. The selection of stitches is easy to see and choose from with a reference guide on the pop-up lid. Natural fibers for example, cotton, linen, wool and bamboo. Fine fabrics like silk, satin, velvet and taffeta. Synthetic fabrics such as polyester and rayon. Zigzag foot – This is the most versatile foot. It can be used for various stitches including straight stitches and zigzag stitches. Over-edge foot – This foot is exclusively for over-edging. The brush on the foot effectively prevents skipped stitches on the raw edge of fabrics. Rolled hem foot – This special foot is for sewing a rolled hem. The curl of the foot helps to form a hem at a constant width. Zipper foot – This foot is for sewing zippers. The zipper teeth are guided through the grooves on the bottom of the foot. Satin stitch foot – A clear plastic foot is ideal for satin stitches and decorative stitches. The center groove on the bottom of foot gives smooth feeding of dense stitches. Craft foot – A clear open toe satin stitch foot for patchwork and appliqué. Blind hem foot – This foot is specially designed for blind hemming. The guide on the foot helps feed the fabric and sew a straight and almost invisible blind-hem. Cording foot – Specially designed to hold strands of cording to create braiding. Overcasting Foot – For use if you don’t have a serger. This foot is specially designed to simulate professional style overlocking. The wires on the foot prevent the fabric edge from puckering or rolling. 1/4” seam foot – Used for patchwork seaming The guide on the foot maintains an exact 1/4” seam allowance. Basting/darning foot – This is a special foot for basting. It holds the fabric while taking a stitch, synchronizing with the needle bar movement. This foot can also be used for free – motion embroidery or quilting. Automatic buttonhole foot – This foot is for buttonholes and for darning. By placing a button in the button holder on the rear of the foot the buttonhole size is automatically selected. Standard buttonhole foot – For manually setting your buttonhole size. Even feed foot – This is a special attachment for hard-to-feed materials. It prevents fabrics from shifting and puckering and is great for quilting and matching plaids. It has no free-arm, a feature that dressmakers might miss. It’s too heavy to be portable for taking to sewing classes/guilds. The Janome MC-6300P manual is easy to read and understand, great for beginners but also for when you get into the more complex features. It has a super slow speed for sewing tight spots. It has top loading bobbin case, a great addition. The extra-large throat space makes it ideal for quilters. The machine is fast and very quiet to operate. The metal chassis makes it built to last. Buy Janome MC-6300P Professional Heavy-Duty Computerized Quilting Sewing Machine w/ Extension Table, Walking Foot, Darning Foot and More! I admit, I skimmed through this not being a quilter. I think I might consider purchasing the Janome if I had the funds. Not for myself, but for my mom. This is a great looking website with a ton in information on it! I have forwarded your website to my wife! She has just recently become interested in quilting so Im sure she will get a lot of knowledge from what you have provided! Thanks very much! You’ve created a great micro niche site first of all! Your site stands out of the crowd and that’s for sure!